It's finally peek bloom time for the DC cherry blossoms! The gift shops in the Smithsonian museums always feature beautiful gifts for her that display the beautiful flower buds in shades of pink and white. That had me wondering how many other Cherry Blossom themed products are out there. Mother's Day is about a month away. The perfect gift for mom is something pretty and luxurious that she wouldn't typically spoil herself with. 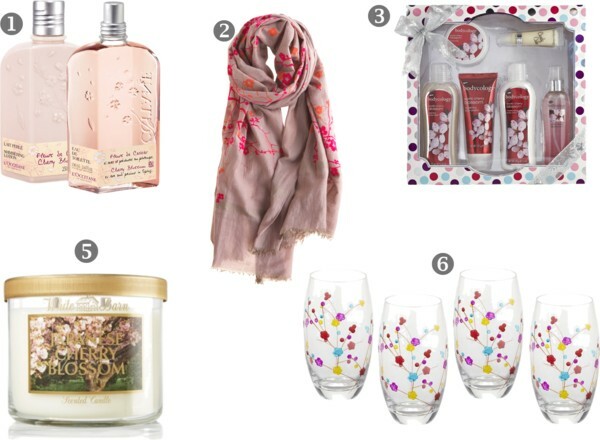 Any of these cherry blossom themed gift items would make the perfect Mother's Day Present. I love cherry blossoms and I bet the perfume smells a bit like almond! Plus how can you go wrong with pink stuff? To find a beautiful Gifts for her is the most difficult task. It is always bit confusing. You have shared beautiful ideas that can be gifted to her. Thanks for sharing.